Kiribati, officially the Republic of Kiribati, is an island nation located in the central tropical Pacific Ocean. 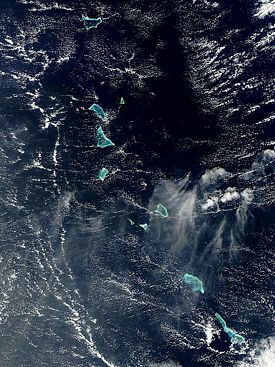 The country's 33 atolls are scattered over 1,351,000 square miles (3,500,000 square kilometers) near the equator. Its name is a Kiribati language rendering of "Gilberts," the former English name of the island group. Some of the bloodiest fighting of the Pacific campaign of the Second World War took place around the capital Bairiki. Nuclear tests were conducted in the region around one of the atolls, Kiritimati (Christmas Island), by the United Kingdom in the late 1950s, and by the United States in 1962. The low-lying islands of this poor country face inundation if and when predicted sea-level rises occur. Already, two uninhabited islets have been swamped. Kiribati, pronounced "keer-ih-bahs," consists of about 32 atolls and one island (Banaba), with at least three atolls in each hemisphere, located in an expanse of ocean equivalent in size to the continental United States. 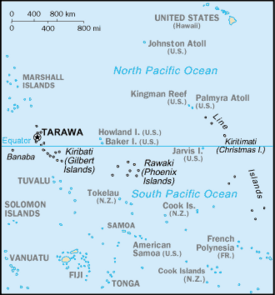 The islands lie roughly halfway between Hawaii and Australia in the Micronesian region of the South Pacific. The three main island groupings are the Gilbert Islands, Phoenix Islands, and Line Islands. The land area, about 277 square miles or 717 square kilometers, is four times the size of Washington, DC. On January 1, 1995, Kiribati moved the International Date Line to include its easternmost islands and make it the same day throughout the country. Kiribati is now the easternmost country in the world, and was the first country to enter into the year 2000 at Caroline Island, which has been renamed Millennium Island. It has been predicted that the land territory of Kiribati will be submerged as sea levels rise due to global climate change. Kiribati includes Kiritimati (Christmas Atoll, in the Line Islands), the largest coral atoll (in terms of land area, not dimensions) in the world, and Banaba Island (Ocean Island), a raised-coral island that was once a rich source of phosphates, but it was mostly mined out before independence. The rest of the land in Kiribati consists of the sand and reef rock islets of atolls or coral islands that rise at most 6.5 feet (less than 2 meters) above sea level. The soil is thin and calcareous, making agriculture difficult. Owing to a population growth rate of more than two percent, and the overcrowding around the capital of South Tarawa, a program of migration was begun in 1989, to move nearly 5000 inhabitants to outlying atolls, mainly in the Line Islands. A program of resettlement to the Phoenix Islands was begun in 1995. Heavy migration mixed with traditional practices such as lagoon latrines and open-pit dumping has caused heavy pollution in the lagoon of south Tarawa atoll, putting ground water at risk. Two uninhabited Kiribati small islets, Tebua Tarawa and Abanuea, disappeared under water in 1999, and the islet of Tepuka Savilivili (Tuvalu) no longer has any coconut trees due to salination of its freshwater. The United Nations Intergovernmental Panel on Climate Change predicts that sea levels will rise by about 20 inches (.5 meters) by 2100 due to global warming, with further rise inevitable. It is thus only a matter of time before Kiribati's remaining arable land becomes subject to increased soil salination and the nation is largely submerged. The I-Kiribati people (or Gilbertese) settled what became known as the Gilbert Islands between 3000 and 2000 years ago. 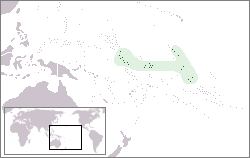 Subsequent invasions by Samoans and Tongans introduced elements of Polynesian to the previously installed Micronesian culture. Later invasions by Fijians introduced Melanesian elements. Extensive intermarriage, however, resulted in a population reasonably homogeneous in appearance, language, and traditions. The first European contact came in the sixteenth century. Whalers, slave traders, and merchant vessels arrived later, in the 1800s. The resulting upheaval fomented local tribal conflicts and introduced debilitating European diseases. The islands were named the Gilbert Islands in 1820 by a Russian admiral, Adam Johann von Krusenstern, and French captain, Louis Isidore Duperrey, after a British captain, Thomas Gilbert, who crossed the archipelago in 1788. In an effort to restore order, the Gilbert and Ellice Islands were forced to become British protectorates in 1892. Banaba Island (Ocean Island) was annexed in 1901, after the discovery of phosphate-rich guano deposits. The protectorates became the crown colony of the Gilbert and Ellice Islands in 1916. Kiritimati (or Christmas Island) became part of the colony in 1919 and the Phoenix Islands were added in 1937. They were governed by a single high commissioner until 1971, when the islands became autonomous. Japan seized part of the islands during World War II to form part of their island defenses. In November 1943, Allied forces attacked Japanese positions at Kiribati's capital Bairiki, on Tarawa Atoll, resulting in some of the bloodiest fighting of the Pacific campaign. The Battle of Tarawa became a turning point in the war for the Allies. Britain began expanding self-government to the islands during the 1960s. In 1975, the Ellice Islands separated from the colony to form the independent state of Tuvalu. The Gilberts obtained internal self-government in 1977, and after general elections held in February 1978, formally became an independent nation on July 12, 1979, under the name of Kiribati. The United States gave up its claims to 14 islands of the Line and Phoenix chains in the 1979 Treaty of Tarawa. 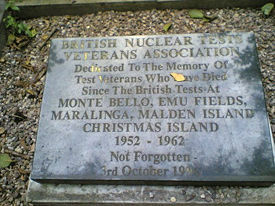 Plaque dedicated to the memory of Test Veterans who died in the British Nuclear tests of 1952 - 1962. Kiritimati or Christmas Island (not to be confused with Christmas Island, a small territory of Australia located in the Indian Ocean), an atoll in the northern Line Islands, was the site of nuclear bomb testing carried out by the United Kingdom between November 1957 and September 1958. Known as the “Grapple Y” and “Grapple Z” series, six detonations of weapons many times more powerful than those discharged at Hiroshima and Nagasaki occurred. In 1962 testing resumed following the breakdown of the Geneva talks. Code–named "Dominic," these tests were conducted by U.S. forces. Between April 25 and July 11 a total of 24 "shots" had occurred. On July 8th a high altitude explosion took place on Johnston Island, 1,200 miles to the northwest. This midnight explosion was clearly visible on Christmas Island. In June of 1963 the testing ended and obsolete and dangerous materials were dumped at sea. Evacuation was not considered necessary for island inhabitants or military personnel during the tests, though in some cases arrangements were made for people to be transported to Fanning Island or simply to boats a distance from the island. In all, the tests carried out in the Pacific Ocean and Australia's territories from 1952 to 1967 involved a total of over 20,000 servicemen from the UK and the US. In 1999 a survey was conducted of 2,500 men involved in the testing; 30 percent of the men had died, most while in their fifties. Their grandchildren suffered Spina bifida at a rate more than five times the usual rate for live births in the United Kingdom. Also reported were more than 200 skeletal abnormalities, while more than 100 veterans' children reported reproductive difficulties. A clan system, known as “boti,” that was imported from Samoa around 1400 C.E., remained the focus of social and political life until around 1870. The British protectorate replaced the boti system with a central government station on each island. The colonial administration reorganized the land tenure system, lining up households, which had been dispersed as hamlets in the bush, in villages along a central thoroughfare. In 1963, the British colonial government abolished a kingship system in the northern islands. The politics of Kiribati takes place in a framework of a presidential system in a representative democratic republic. The government consists of a parliament (“Maneaba ni Maungatabu”), which is unicameral. The president (Beretitenti) is elected by popular vote every four years and is both head of government and chief of state. There are loosely structured political parties. There is universal suffrage at age 18. Executive power is exercised by the President. Legislative power is vested in both the Parliament and the House of Assembly of Kiribati. The judicial branch of the government, which is independent, includes a court of appeals and a high court, as well as a magistrate's court on each inhabited island. Magistrates’ courts jurisdiction is unlimited in land matters but limited in criminal and civil cases. There are small police forces on all islands. Emerging problems include embezzlement, robbery, sexual coercion, and child and domestic abuse, often linked to alcohol use. Four of the former districts (including Tarawa) lie in the Gilbert Islands, where most of the country's population lives. Only three of the Line Islands are inhabited, while the Phoenix Islands are uninhabited except for Kanton and Orona, where there are 80 people, and have no representation. Banaba itself is sparsely inhabited. There is also a non-elected representative of the Banabans on Rabi Island in the nation of Fiji. Each of the 21 inhabited islands has a local council that takes care of daily affairs. Tarawa atoll has three councils—Betio Town Council, Te Inainano Urban Council (for the rest of South Tarawa), and Eutan Tarawa Council (for North Tarawa). The youngest Commonwealth Head of State, Ieremia Tabai, dominated post-independence politics. At 29 years of age, Tabai became Kiribati's first President and served three terms from 1979 to 1991. Teburoro Tito (or Tiito, pronounced Seetoh) was elected President in 1994, and re-elected in 1998 and 2002. Anote Tong, a London School of Economics graduate, became President in 2003. Banaba Island residents are seeking to secede and have their island placed under the protection of Fiji. After Banaba was devastated by phosphate mining, most Banabans moved to the island of Rabi in the Fiji Islands in the 1940s. They enjoy full Fiji citizenship. The Kiribati Government designated a Banaban seat in the legislature and returned land acquired by the government for phosphate mining. Only 200-300 people remain on Banaba. Kiribati's per capita gross domestic product of less than U.S.$1000 makes it one of the poorest countries in the world. Phosphates had been profitably exported from Banaba Island since the turn of the twentieth century, but the deposits were exhausted in 1979. Kiribati now depends on foreign assistance and revenue from fishing licenses, worker remittances, and tourism for a large percentage of its income. Nearly all of Kiribati's essential foodstuffs and manufactured items are imported. The exhaustion of phosphate deposits in 1979, had a devastating impact on Kiribati's economy. Receipts from phosphates had accounted for roughly 80 percent of export earnings and 50 percent of government revenue. Per capita GDP was more than cut in half between 1979 and 1981. A trust fund financed by phosphate earnings over the years—the Revenue Equalization Reserve Fund—contained more than U.S.$350 million in 1999. Fishing fleets from South Korea, Japan, Taiwan, and the United States pay a licensing fee in order to operate in Kiribati's territorial waters. These licenses produce over U.S.$20 million annually, with a surge in 1998 to nearly U.S.$30 million when El Niño climatic conditions boosted the local catch. Illegal, unlicensed fishing in its exclusive economic zone is a problem. Official development assistance amounts to between U.S.$15 million and U.S.$20 million per year. The largest donors are Japan, the United Kingdom, Australia, and New Zealand. Remittances from Kiribati workers living abroad provide another U.S.$5 million. Between 3000 and 4000 tourists per year provide U.S.$5 million to U.S.$10 million in revenue. Attractions include World War II battle sites, game fishing, ecotourism, and the Millennium Islands, situated just inside the International Date Line and the first place on earth to celebrate every New Year. Most islanders engage in subsistence fishing and the growing of food crops like bananas, breadfruit, and papaya. The leading export is the coconut product copra, which accounts for about two-thirds of export revenue. Other exports include pet fish, shark fins, and seaweed. Kiribati's principal trading partner is Australia. Exports totaled U.S.$17 million in 2004. Export goods are copra (62 percent), seaweed, and fish. Export partners were France (45.7 percent), Japan (29.2 percent), United States (9.1 percent), Thailand (5.4 percent), and other unspecified nations (10.6 percent). Imports totaled U.S.$62 million in 2004. Import commodities consist of foodstuffs, machinery, and equipment, miscellaneous manufactured goods, and fuel. Import partners were Australia (33.6 percent), Fiji (29.8 percent), Japan (10.3 percent), New Zealand (6.9 percent), France (4.1 percent), and other unspecified nations (15.3 percent). With a GDP of U.S.$79 million in 2001, Kiribati was ranked 224th in the world. Per capita GDP that year was U.S.$800. The population of Kiribati was 105,432 in June 2006. Life expectancy for the total population was 62.08 years. The nationality is I-Kiribati. Ethnicity was 98.8 percent Micronesian in 2000. In the mythology of traditional I-Kiribati religion, a giant spider, Nareau, was the creator, followed by spirits (“anti”), half spirits, half humans, and finally humans. The “anti” were the focus of I-Kiribati worship before Protestant missionaries arrived in 1852, and are still respected. Rivalry between the Catholic and Protestant missions resulted in animosities that have persisted in national and island politics. About 52 percent of I-Kiribati are Catholic, almost half are Protestant, and the remainder are Seventh-Day Adventist, Baha'i, and members of the Church of God and the Church of Latter-Day Saints. Although polygamy was practiced, marriage in Kiribati is now monogamous. Arranged marriages remain common, especially in rural areas. Most families tolerate elopements. Virginity of the bride remains valued despite criticism by churches. Marriage is almost universal, and divorce is unpopular and uncommon. The household is commonly based on a single nuclear family and may include aging parents and adoptive kin. Married women move to live with the husband's tribe. The main kinship units are “mwenga” (household), “utu” (related family), and “kainga” (identified by having a common ancestor). Inheritance of property and kinship are traced through both the mother's and the father's families. Adoption is widely practiced, especially between close kin. While English is the constitution's and law's language, and is taught in primary and secondary schools, Kiribati (formerly known as Gilbertese), the native Micronesian language, is widely spoken. While the language shows considerable borrowing from Polynesia, it is distinct from the language of neighboring Tuvalu and the Marshall Islands. Note that in Kiribati/Gilbertese there is no letter “s,” the sound is represented by “ti.” Many adults on the outer islands speak little English. Modern Kiribati can be considered relatively classless, although a new class of young leaders is emerging, threatening the village-based traditional authority of elders. There are growing income disparities, and access to higher education is a key differentiating factor. All children over the age of 6 attend school, although only a minority continue on to higher education. Fish are a primary food source, since only the most hardy plants can grow on Kiribati. Crops include coconut, giant swamp taro, breadfruit, pandanus, and a native fig. Coconut is central to the diet and is valued for the sweet, vitamin-rich sap cut from the flower base. This sap, also called toddy, is used as a drink for children, as a base for syrup, and can also be fermented into an alcoholic drink. Imported rice, flour, canned butter, and canned fish and meat, have become an important part of the diet. The display and eating of prestige foods, such as crayfish, giant clam, pig, chicken, and giant swamp taro, is central to celebrations. The most valued crop is giant swamp taro, grown in pits dug into the water lens under each atoll. Rural houses are open-sided rectangular structures with thatched roofs and raised floors. In towns, more houses are built with concrete block and corrugated iron. Open-sided meeting houses, known as “maneaba,” owned by a family, church community, or village, function as a central place for group activities. The floor has unmarked but known sitting places arranged around the perimeter, belonging to each family represented there. This is where a representative (usually the oldest male) of each family participates in community discussions and decision-making. Churches are architecturally European and often are the largest structures in a village. Kiribati has a history of contrived and ritualized duels. The armor was made of thickly woven sennet, a kind of coconut fiber. The duelists wore helmets made of blowfish remains. The helmets were resilient and, due to the structure of blowfish, covered with many points, which could damage weapons. The weapons resembled broadswords with a serrated edge created with shark teeth. The duels were performed mostly for the purpose of settling disputes and maintaining honor. Kiribati has been known for its traditional martial arts that were kept secret within families for generations. The Kiribati martial arts have no kicking as in Karate or Kung Fu, and speed is more important than power. These martial arts include Nabakai, Nakara, Ruabou, Tabiang, Taborara, Tebania, Temata-aua, Te Rawarawanimon, and Terotauea. Kiribati folk music is generally based around chanting or other forms of vocalizing, accompanied by body percussion. Performances in modern Kiribati usually involve a seated chorus, accompanied by a guitar. During formal performances of the standing dance ("Te Kaimatoa") or the hip dance ("Te Buki"), a wooden box is used as a percussion instrument. This box is constructed so as to give a hollow and reverberating tone when struck simultaneously by a chorus of men sitting around it. Traditional songs often have a love theme. There are also competitive, religious, children's, patriotic, war, and wedding songs. There are also stick dances (which accompany legends and semi-historical stories). These stick dances or "tirere" (pronounced "seerere") are performed during festivals. The uniqueness of Kiribati dance is its emphasis on the outstretched arms of the dancer and the sudden birdlike movement of the head. The Frigate bird ("Fregataminor") on the Kiribati flag refers to this bird-like style of Kiribati dancing. Most dances are performed in a standing or sitting position with limited and staggered movement. Smiling while dancing as with the modern Hawaiian "hula" is generally considered vulgar by Kiribati dance standards. This is because dance has traditionally been viewed as more than a form of entertainment but also as a form of storytelling and a display of the skill, beauty, and endurance of the dancer. ↑ Kiribati government website. Government of Kiribati. Retrieved December 10, 2011. ↑ 2.0 2.1 2.2 2.3 Kiribati. International Monetary Fund. Retrieved December 10, 2011. Macdonald, Barrie. Cinderellas of the Empire. University of the South Pacific, 2001. Talu, Sister Alaima, et al. Kiribati: Aspects of History. IPS, USP, 1979. This page was last modified on 19 April 2018, at 15:25.